We are well into 2018, but unfortunately most of us have already fallen off the wagon with our New Year’s Resolution goals. Remember those? It happens to the best of us, even when we have the best intentions. The good news is that it’s easier to get back on track than you think! Here is my step-by-step guide to help lead you to success! Step 1: Make sure your resolution is something you REALLY want to do. Re-evaluate what you need more of in your life and what you can live without. Take some time to think about the things you can improve upon. How much would these things affect your mind, body and overall health? Is this something you really want? Choosing a resolution based on what you want rather than what you think you should be doing is much easier and fun to work towards. Step 2: Set attainable goals. Don’t take on more than you can manage and prioritize what you want to accomplish. Keep it simple yet attainable. For example, if your goal is to lose weight, don’t put a number to it. Instead, set your goal to do things that will get you there. Sign up for a new exercise class several times per week. Ask for help when needed and find a friendly health coach to guide you along. Choose one food to eliminate from your diet, rather than a list of foods. Plan ahead. This could be one of the most important things you do that leads you to success. Whether it’s weight loss, starting a meditation practice, or taking that vacation you’ve been dreaming about; planning ahead is imperative. For example, stock your fridge with whole foods that are easy to grab. Keep fresh, cut up vegetables and fruits on hand and portion controlled snacks such as hummus, guacamole or Setton Farms’ Pistachio + Blueberry Cranberry Chewy Bites to access for a quick and satisfying snack. This might take an extra 10 minutes out of your day to prep, but I guarantee it will be well worth the time. Step 4: Remember it’s not all or nothing! Everything you do counts towards reaching your goal. It’s perfectly fine to expect slip ups and off days. Doesn’t mean you should give up if you slip up. Don’t waste your time beating yourself up if you missed your daily run, or splurged on a meal during a festive holiday with friends. Allow for times like these and then get back to your plan. Even a 10-minute workout in your pajamas is better than nothing. Starting your morning with a large glass of lemon water can quickly get you back on track to better eating habits. Five deep breathes during a red light while driving can sometimes do the trick if you skip your morning meditation. Think long term and do the best you can! 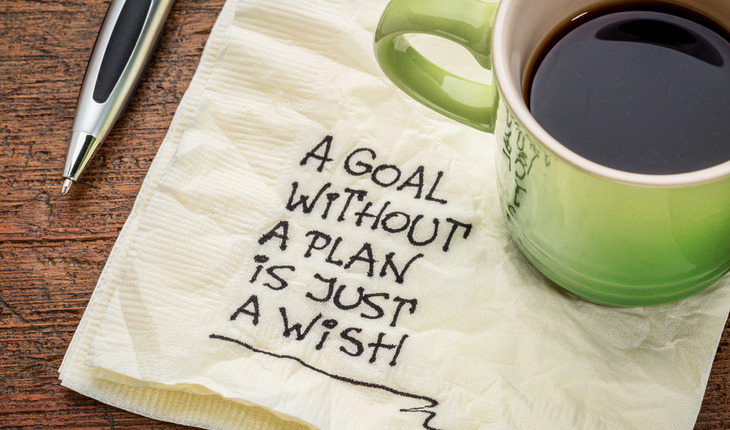 Step 5: Incorporate your goals into a lifestyle plan. Whether you’ve achieved your New Year’s goal, or are half way there, don’t stop now. The key to long term success is to create healthy habits that are ongoing. What can you do each day to get you to where you want to be? Cultivating healthy habits that help you attain your goals is the key to success. No matter what life brings your way, remember to care for yourself and carve out time for things that are most important to you.